I had to get to Boone’s Fish House & Oyster Room eventually. Having reviewed all the other “Rooms” in Portland, the newest one just hadn’t come up on my list yet despite seeing a number of reviews of it. But this past Saturday I was finally ready to experience the waterfront restaurant for myself. Unfortunately, it was a little too cold to sit outside at a table or the bar, but those certainly would be great options in warmer temperatures. The scenery is great, and in my opinion, there’s no better place to eat than on/by the water. When we walked inside, there wasn’t much in the way of outdoor views, but the interior was certainly very nice on it’s own. The look of the restaurant could be described as modern rustic with beautiful wooden beams overhead and a nice bar. The kitchen was open, though partially blocked from certain areas. The scent of wood-fire from the grill was quite prominent and pleasing. There were chalkboards hanging with the specials written on them. We walked up to the hostess who then checked to see if our table was available and were promptly seated with menus. Water soon followed. The menu was a large, laminated and two-sided. On the front were food items and on the back were wine selections. There was also a menu with featured food items and beer, cocktails, and additional wines. The main menu was quite diverse. There were apps, salads, lobster, fried foods, burgers, pizza, dinner plates, and wok items. The feature menu had more of the same with a number of fish, sauces, and sides. We also got a paper and pencil on which we could choose from a variety of available oysters. My initial view of the menu had me trying to figure out if it was too much or just offered great variety. I settled on the latter. Yes, it was a lot, but there really was something for everyone. I had been seriously contemplating some fried seafood before I got there and was little disappointed that there were limited options in that category, but I felt that what they did have were solid choices. We decided not to order drinks since we had some before arriving, so I got over my menu concerns and became focused on getting some grub in my belly. Two ideas were solidified in my mind before even looking at the menus – I wanted an app and didn’t want any raw seafood. I laid my eyes upon the Oyster Room Meatballs with local pork, local oysters, and sweet soy. From there I went with a half pint of the fried Whole Belly Clams in crumbs. 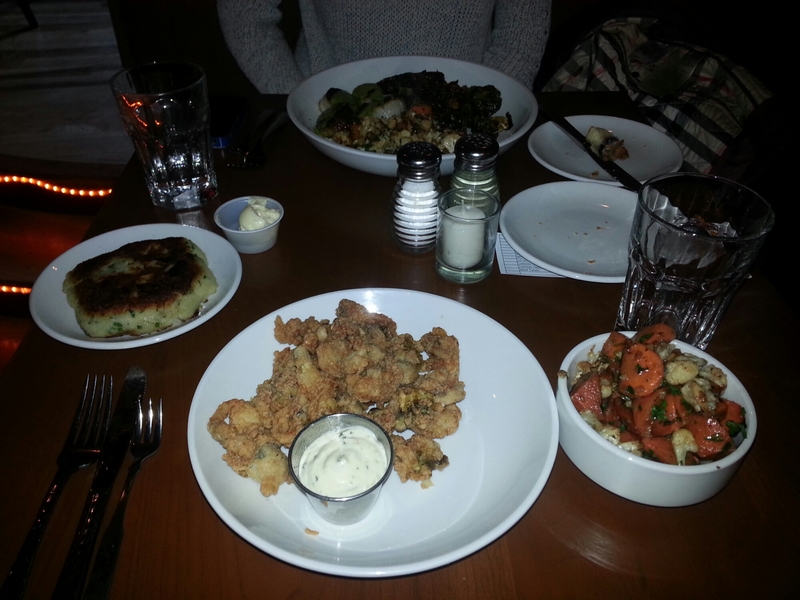 Since I only ordered a half-pint of the clams and wanted to try a few different foods, I decided to go with two sides. The Farm Vegetables and Caramelized Onion Hash Brown got my attention. My wife ordered Scallops with the Zippy Sauce and chose Crispy Brussel Sprouts and Farm Vegetables as sides. When the waitress came back for our orders she delivered some blueberry bread in lieu of biscuits which weren’t ready yet. We then piled our orders on her and anxiously awaited a bunch of food. While waiting for our feast, my wife and I discussed the surprising allegorical correlation between mustachioed men from Mozambique and a melancholy cow with a certain curiosity. Before I could even get to my second point of comparison, a bowl of five meatballs arrived. My hunger convinced me it was time to dig in. I chopped the first one in half, noticing a light, fluffy consistency. I popped a half of the ball in my mouth. It was indeed light and fluffy, but not overly so. In my opinion, it was the perfect combination of meat and filler, but what really gave it life was the sauce. The sweet soy was…well…sweet and salty with just a little bit of heat. I didn’t expect the heat but it was a welcome surprise. When the waitress picked up my empty bowl a short time later, she asked how hot they were. I told her they weren’t that hot, but I would have loved even more fire. After another short wait, our meals showed up. My half pint of clams looked generous and came with a sufficient amount of tarter sauce. A separate plate housed my hash brown and a bowl was full with the farm vegetables. My wife’s food was on one large plate. I dug into my veggies first. They were very good – crunchy, buttery, and well seasoned. Next I tried the hash brown. It was crispy on the outside which I liked, but it lacked seasoning. It wasn’t bad, but it needed something more; even a sauce of some sort would have worked. I moved on to Saturday night’s main event. I bodyslammed a plain clam into my mouth, and then suplexed one into tarter sauce before proceeding to consume that too. The clams were definitely fresh. The crumbs gave them some salt and crispness. They were excellent. The tarter sauce was interesting. It was definitely more lemony than I was used to, but I liked it, particularly since there was no lemon on the plate. I felt it worked very well with the clams. Shortly after starting our meal, we received some biscuits. In the battle between my food and I, I won. I ate every last crumb, stopping at times only to steal some of my wife’s. Her sprouts and scallops were great. She couldn’t quite finish all of her meal, but it was good enough for her to try like hell. I was impressed with her performance. After a congratulatory salute, we quietly decided that dessert would not be an option, but I did finish the biscuits and called them dessert. When the waitress came by to check if we were interested in something sweet though, I still wanted to hear what was available. I don’t really remember much except that I heard the words “peanut” and “butter” consecutively. I shook my head hard to erase those words from my brain, knowing that dessert – even one with peanut butter – would ruin my night. Our meals came to about $80 after all was said and done. We didn’t get drinks, but ordered a couple sides each in order to try different items. I was quite pleased overall. The location is awesome and the atmosphere is one I really enjoyed. Service was solid and except for a small bump in the road in the way of an under-seasoned hash brown, the food was really good. I hope that in the future they will add more fried seafood options by the pint or fisherman’s platter-type plates. I was really happy with the clams, but the only similar option was fried oysters. I would do cartwheels for good fried scallops or the like. Nonetheless, their diverse menu makes them quite unusual compared to other seafood restaurants and that’s an endearing quality. I’ll be back to Boone’s this summer to sit at the outside bar for sure. Feel free to email me at peterpeterportlandeater@yahoo.com with any thoughts, suggestions, criticisms, or otherwise helpful info or feel free to post your thoughts below. Also, like the Peterpeterportlandeater page on Facebook. Want to be notified whenever Peterpeterportlandeater releases a new blog entry? Subscribe to my blog by clicking the “Follow” button on the right side of this page. Seriously, do it. What are you waiting for? This entry was posted in Portland, ME food on April 23, 2014 by peterpeterportlandeater. Peter I’m glad you had an opportunity to come in and sample our selections. One small note: at any time we will grill, sautee’, or fry a fish (or scallops!) of your choice. The menu’s have a ton of options and that info may have been lost in the shuffle, but we can definitely fry some scallops for you at any time! Again, thank you for the kind words and we hope to see you for Summah!